Roberto Luongo vs. Cory Schneider: Who Should Lead the Canucks? Who should be the starting goalie for the Vancouver Canucks? Roberto Luongo or Cory Schneider? We will settle that dispute right now. The Hockey Fanatic thinks that Luongo should be the starting goalie for the Canucks. The goaler-coaster continues to roll in Vancouver as Luongo was named the starter for a third straight game against the Chicago Blackhawks on Friday. Luongo was great again as the Canucks defeated Chicago in a shootout. 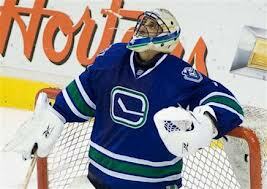 So the question becomes has Roberto Luongo regained his position as the number one goalie for the Vancouver Canucks? If it were up to us, we would suggest yes. Luongo has handled this situation as a true professional and has really played solid in every appearance he has made for the Canucks this season. We all know the history right? Luongo lost his starting job top Cory Schneider in last Springs playoffs as the heavily favored Canucks bowed out to the eight seed and eventual Stanley Cup Champions Los Angeles Kings. The talk was then that Luongo would be traded and he probably would have been by now if it was not for the NHL lockout. Do the Canucks and Canucks’ fans even know what they have in Roberto Luongo? Everyone was quick to write him off in favor of Cory Schneider. We’ve all heard of the killer contract, the fact that Luongo cracks under pressure in the playoffs. The people of Vancouver have always been hard on Bobby Lou. It is like they have a love/hate relationship with the guy. Have the forgotten that it was Luongo who got the Canucks to the seventh game of the Stanley Cup finals in 2011. People forget that when the going got tough the Sedins got going… that is left the building. Where were they in the past three rounds of the playoffs for the Canucks. It was Luongo not Schneider who was team captain and lead the team for the past few years. Roberto Luongo is arguably one of the top five goalies in the league. He was within a couple of goals of the Canucks winning their first ever Stanley Cup and continues to set a number of Canucks records for goaltenders. Luongo is second all-time in games played for the Canucks (behind Kirk McLean), He is first in wins with 226 and counting and is the team leader in shutouts with 34 (and counting). Cory Schneider has played a total of 72 NHL games… yet the Canucks feel that he is their starting goalie? Whoa not so fast there Canuckleheads. While it is true that Schneider is the Canucks all-time leader in save percentage and goal against average the man he edges out is Luongo. Again we should point out that Cory Schneider has only played a total of 72 games and has virtually no pressure on him as of yet. Luongo is the one player with the Canucks that fans and media are quick to get on should he have a sub-par performance. Roberto Luongo is a veteran, skilled goaltender. Any team in the league save maybe the Kings would be lucky to have him. While he has a no trade clause can you imagine what a team like the Edmonton Oilers could do if they had Luongo between the pipes? With all of their young skill, you would have to think that the Oilers would definitely have a great chance to win a Cup or two with a goaltender of that caliber. We cannot see the Canucks trading Luongo to a division rival but you never know. Luongo’s play this year has been excellent. He even tweeted that “Being a backup is a lot funner than I anticipated…” The pressure is off and Roberto can just play his game, and when he’s on his game very few are better. Fact is we simply like Roberto Luongo better than Cory Schneider. We like his style of play, we like his professionalism, we like his flare. Sure Schneider will get his time, but the time is not now. If the Vancouver Canucks want to win the Stanley Cup Roberto Luongo is the man to take them to the promise land. You have to think that the Canucks time is quickly passing. Their best options is to retain Luongo and let him play and let him be the starter. Should he falter then go to Schneider who appears to be more than capable of being a decent goaltender. He’s no Luongo though and it still remains to be seen if he can win the big games. While Roberto does not yet have a Stanley Cup if he gets the chance to play in the Finals again, we’re pretty sure that he will come out victorious. Is there a goaltending controversy in Vancouver? You be the judge. Shop for Vancouver Canucks Gear at Shop.NHL.com!